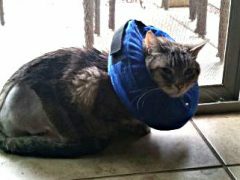 Learn all about the best pain management practices, techniques and latest developments for treating post-op amputation pain in cats with Stephen Cital, RVT on Tripawd Talk Radio. EMFs are proven to cause issues with insects and migratory birds’ flying patterns, but how do EMFs affect the dogs and cats living in our home? Can EMFs increase pain symptoms and create problems for people and animals with compromised immune systems? Today’s Tripawd Talk Radio takes a look at these questions. Dogs are good at hiding their pain. 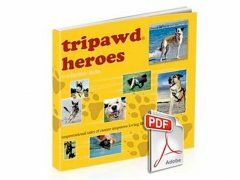 Do you know how to recognize the signs of arthritis in Tripawd dogs? Today we’ll learn from veterinary surgeon Hanah Capon, MRCVS annd Managing Director of the CAM (Canine Arthritis Management) organization in the UK. 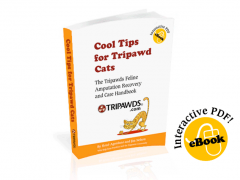 Learn the best tips to recognize, treat and prevent pain in your three-legged Tripawd dog with Dr. Mike Petty, pain management veterinarian and author of Dr. Petty’s Pain Relief for Dogs.